During the months of June, July, and August, most rentals are for a minimum of one week, with the rental period running from Sunday to Sunday. Occasionally split weeks are available, with midweek and weekend rates. During the Spring and Fall seasons split weeks are often available at reduced shoulder season rates. The Inn is closed during the winter months. The apartments are available as one, or two room units which can accommodate two, or four guests respectively. Every unit is air conditioned and has a fully equipped kitchen, a private bath, ceiling fan, and color television. Bed linens are included with all rentals. Towels are provided for weekend rentals. Many activites are available in Wrightsville Beach or nearby. These include: golf, tennis, bicycling, sailboat & motorboat rentals offshore fishing charters, windsurfing, surfing, SCUBA, as well as pier and surf fishing. Your Innkeepers can help arrange any of these activities either before or after your arrival. 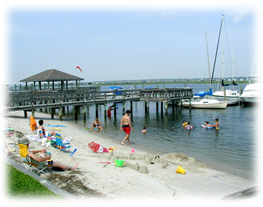 Wrightsville Beach is also famous for it's many waterfront restaurants. In addition, Wrightsville Beach is only minutes away from the historic port city of Wilmington which has an extensive array of riverfront shopping and dining possibilities. Reservations may be made by phone, mail, or email. A deposit is required to confirm reservations, and must be received within 10 days of the reservation request or the reservation will be canceled without notice. Carolina Temple Apartments Island Inn are owned and managed by Steve and Mary Wright. Please feel free to contact us about your vacation plans. We look forward to being your hosts at Wrightsville Beach.